We’d love your help. 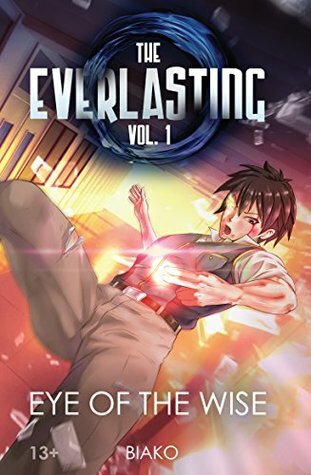 Let us know what’s wrong with this preview of The Everlasting, Vol. 1 by Biako. Our story b The Everlasting—a title given to those who’ve reached a state closest to godhood. This honor is a dream to all novice mages and warriors. To ask other readers questions about The Everlasting, Vol. 1, please sign up. I picked this book up because of an interest in OELN (Original English Light Novels) and was curious as to how this one would feel alongside its Japanese contemporaries. The Everlasting is a generally uninspiring novel at the end of the day. Most of the characters felt two dimensional and uninteresting, certain scenes played no part in the overall story, and the protagonist came across as very passive, letting the plot push him rather than vice-versa. Speaking of the protagonist, he is a few hai I picked this book up because of an interest in OELN (Original English Light Novels) and was curious as to how this one would feel alongside its Japanese contemporaries. Speaking of the protagonist, he is a few hairs short of being a Mary Sue. He's overpowered, carries a legendary sword, already has full mastery of martial arts, and by the end of the story has a cheat ability. (even referred to as such by the Principle in the book.) These abilities, coupled with a deus ex machina ending to the climax of the story leaves the reader never truly feeling like the protagonist is ever in danger. (even when he looks like he's almost dead/dead) It's also no surprise that he has even more special abilities as the foreshadowing has all the subtlety of a freight train. The writing and editing is pretty good. There are a few places where it falters a bit, but overall it's fairly strong and keeps the story from feeling more like a fanfiction rather than a light novel. The cover art is also really well done and adds a lot of appeal to the novel. I am also glad that they did the post story comments from the author, in keeping with the Japanese light novel tradition. It teaches a bit about the author and his history with the English language which explained a couple elements in the story. In the end, though I did enjoy certain elements of this story, I would have rather seen the hero's journey play out from a more relatable starting point rather than starting out already over powered. This story would have been far more interesting if the protagonist had to work to gain the power he had rather than already have it bestowed, or solving the climax of the story through his own wits rather than an insane game ending cheat and outside influences. Yes, other light novels do have over powered protagonists, but they make up for it through having other elements. Unfortunately The Everlasting doesn't do this and thus feels empty. That all said, others have enjoyed this book, so if you are interested in reading this novel, go for it. I could be the anomaly and you could find it to be amazing! I'm not the kind of person who enjoys reading a fantasy novel. But I do enjoy the storyline since the story is interesting. And I love the fact that Biako takes the time to explain how their magic mechanism works in a simple manner. While the book does give you the fantasy feeling the same as any other novel, it also contains the usual anime trope that you can find in the anime and manga. Well, it's expected that a book like this will have the anime trope. But luckily it's not that many. If you d I'm not the kind of person who enjoys reading a fantasy novel. But I do enjoy the storyline since the story is interesting. And I love the fact that Biako takes the time to explain how their magic mechanism works in a simple manner. While the book does give you the fantasy feeling the same as any other novel, it also contains the usual anime trope that you can find in the anime and manga. Well, it's expected that a book like this will have the anime trope. But luckily it's not that many. If you don't seem to like the anime trope, fret not because the anime tropes aren't off-putting at all. The Everlasting is an interesting mix of magical fantasy with modern school life aspects. Our lead character, Asura, transfers into a magical high school on the eve before the schools massive battle ranking affair. An antagonist infiltrates on this day and chaos immediately ensues. The cover image is soon brought up and we're done. Overall this on the surface, while not being something that is innovating the medium or acting like a game changer, managed to satisfactorily hit ever checkbox for th The Everlasting is an interesting mix of magical fantasy with modern school life aspects. Our lead character, Asura, transfers into a magical high school on the eve before the schools massive battle ranking affair. An antagonist infiltrates on this day and chaos immediately ensues. The cover image is soon brought up and we're done. Overall this on the surface, while not being something that is innovating the medium or acting like a game changer, managed to satisfactorily hit ever checkbox for this type of series and do it in such a way that it becomes a gripping page turner. I loved the breezily refreshing writing style of the author, as they waste no time bogging us down in details or needlessly spending time on dialogue that leads to nowhere. For many times it seems as if it was written in such a way that its almost no questions asked at times. I didnt have to find my way rereading action parts due to a lack of clarity or revisit facts due to messy descriptions. The crisp writing style also made all the dialogue feel like characters were immediately saying what was important and we wasted no time with filler commentary. Though I like some bantering from characters and also just some silly dialogue moments, the Everlasting makes a commendable effort to stay on track. For anyone that is familiar with these type of stories, they'd be instantly familiar with this book and also with where it starts and ends up. I do find myself in love with these stories and actually loved this alot. The extended cast of the characters around Asura were fun. Shiki is the true bro, the best of the best, and I loved his company. I do hope get gets closer to Asura in the future (otp). Nassi was fun , and Kaori added an interesting dynamic to the cast. I'm glad we didnt have the tsundere type of character among this list (though perhaps Nassi is the male tsundere we didnt know we needed, but am glad we have). The magic system was also cool. I know the author through Vic's Lab, which published both of our books. I hardly ever read fantasy because I'm a scifi guy, but Biako had asked me to read it, so I gave it a try. (Although I stick to sci-fi reading, I do enjoy fantasy anime, martial arts movies, and JRPGs, so it wasn't that difficult for me to get out of my scifi comfort zone to read this). To be honest, although I rarely read fantasy, I really enjoyed The Everlasting. It’s about a teenage guy who uses warrior arts and is transfe I know the author through Vic's Lab, which published both of our books. I hardly ever read fantasy because I'm a scifi guy, but Biako had asked me to read it, so I gave it a try. (Although I stick to sci-fi reading, I do enjoy fantasy anime, martial arts movies, and JRPGs, so it wasn't that difficult for me to get out of my scifi comfort zone to read this).